Crafted with the look of vintage blue and white pottery in mind, the Leland bedding collection is a striking ensemble that is sure to impress anyone who sees it. The Leland ensemble features a beautiful deep blue damask set against a linen background. A simple pleated bedskirt with a linen stripe adds extra dimension to your room. The attention to details is exquisite, with buttons and twisted cording to finish off the look. The contrasting stripes in the Euro sham, bedskirt, and neck roll pillow are the perfect offset to the brilliant damask of the window treatments and comforter. Choose from a classy scalloped valance, drapery panels, or mix the two for a custom window. Croscill has been manufacturing high quality bedding at an affordable price for over 50 years! The Leland Bedding Collection is a stunning set. 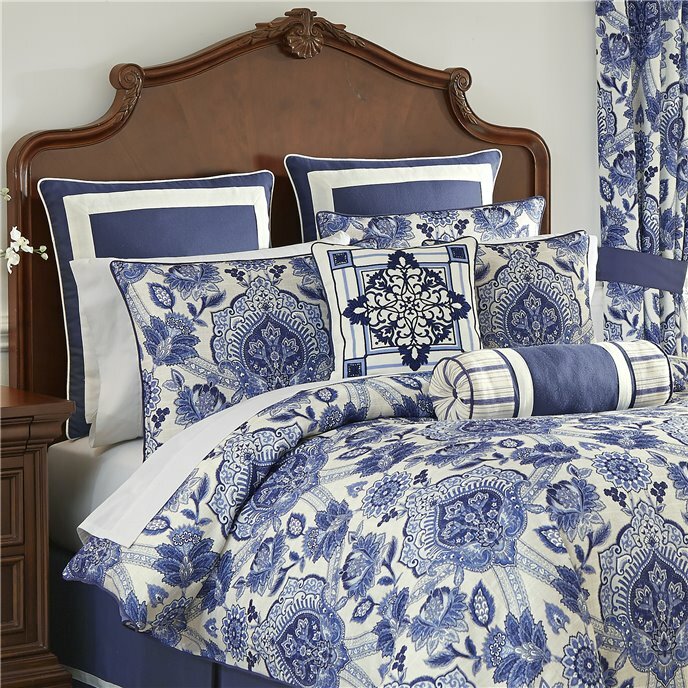 The collection features a striking blue and linen damask pattern, creating a lovely contrast. The comforter and pillow shams are trimmed with a solid blue covered cord. The Bedskirt is made up of shades of dark blue and is trimmed with a contrasting ivory textured fabric band. One (1) Queen Comforter, two (2) Standard Shams, one (1) Bedskirt 15in drop, Comforter measures 92x96, polyester fabric and poly fiber fill, dry clean recommended, imported. Manufactured by Croscill. The Leland Bedding Collection is a stunning set. The collection features a striking blue and linen damask pattern, creating a lovely contrast. The comforter and pillow shams are trimmed with a solid blue covered cord. The Bedskirt is made up of shades of dark blue and is trimmed with a contrasting ivory textured fabric band. One (1) Cal King Comforter, two (2) King Shams, one (1) Bedskirt 15in drop, Comforter measures 110x96, polyester fabric and poly fiber fill, dry clean recommended, imported. Manufactured by Croscill. The Leland Bedding Collection is a stunning set. The collection features a striking blue and linen damask pattern, creating a lovely contrast. The comforter and pillow shams are trimmed with a solid blue covered cord. The Bedskirt is made up of shades of dark blue and is trimmed with a contrasting ivory textured fabric band. One (1) King Comforter, two (2) King Shams, one (1) Bedskirt 15in drop, Comforter measures 110x96, polyester fabric and poly fiber fill, dry clean recommended, imported. Manufactured by Croscill. The Leland European Sham is a beautiful shade of dark blue framed with an ivory textured fabric band. This sham reverses to the solid dark blue and is trimmed with an ivory covered cord. One (1) European Sham, Measures 26x26, polyester fabric, dry clean recommended, imported. Manufactured by Croscill. The Leland 18x18 Square Pillow features an intricate damask pattern in shades of blue and linen creating a stunning contrast. This pillow reverses to a solid blue fabric and is trimmed with a lovely covered cord. One (1) Square Pillow, Measures 18x18, polyester fabric and poly fiber fill, spot clean recommended, imported. Manufactured by Croscill. The Leland 16x16 Fashion Pillow features a stunning medallion design embroidered on the face of the pillow. This pillow reverses to a solid blue and is trimmed with a lovely covered cord. One (1) Fashion Pillow, Measures 16x16, polyester fabric and poly fiber fill, spot clean recommended, imported. Manufactured by Croscill. The Leland 21x7 Neckroll Pillow is a lovely pillow in various shades of blue presented in an array of stripes. A covered button and cord adorn each end of this pillow adding the perfect finishing touch. One (1) Boudoir Pillow, Measures 21x7, polyester fabric and poly fiber fill, spot clean recommended, imported. Manufactured by Croscill. The Leland Double Layer Valance features one layer of a beautiful printed damask with a coordinating layer in dark blue and trimmed with a lovely covered cord. One (1) Valance, Measures 67x18, polyester fabric, dry clean recommended, imported. Manufactured by Croscill. The Leland Curtain Panel Pair features an intricate damask pattern in shades of blue and linen creating a stunning contrast. Each panel is lined with a solid white polyester lining and include encased weights in the bottom hem. Two (2) Window Panels, two (2) Tiebacks, Measures 82Wx84L, polyester fabric, dry clean recommended, imported. (2nd image shows with valance sold separately.) Manufactured by Croscill. The Leland Curtain Panel Pair features an intricate damask pattern in shades of blue and linen creating a stunning contrast. Each panel is lined with a solid white polyester lining and include encased weights in the bottom hem. Two (2) Window Panels, two (2) Tiebacks, Measures 82Wx95L, polyester fabric, dry clean recommended, imported. (2nd image shows with valance sold separately.) Manufactured by Croscill.